Seasons come, seasons go, but for a century the D.O.C. has demonstrated how the great outdoors can be a defining element of a liberal arts education. 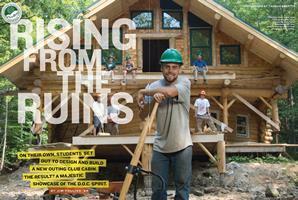 On their own, students set out to design and build a new Outing Club cabin. The result? A majestic showcase of the D.O.C. spirit. 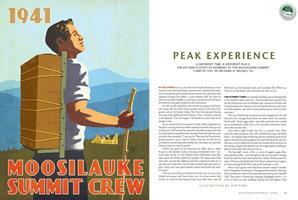 A different time, a different place: the joy and ecstasy of working at the Moosilauke summit camp in 1941. The Outing Club has honed its legend for a century. Here are just a few of the highlights. An author looks back on the English professor who changed his life: James Cox. On the eve of her son’s departure for college, an alumna and her son switch roles. Gay and lesbian alums have Ed Hermance ’62 to thank for the spark that led to their own alumni organization 25 years ago. As media bureaus abroad retrench, videographer Jason Maloney ’91 steps in to deliver the news. This bird’s-eye view of the Homecoming bonfire structure was shot from a helicopter circling 1,000 feet above the Green last fall. 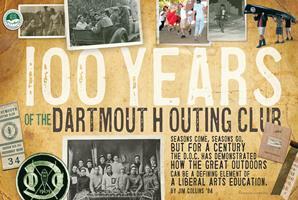 This year Dartmouth Night takes place October 23.